In today's dynamic and volatile markets, whether buying or selling, what corporate officers need to know is the worth of an asset today, a task that for many has become complex and at times confusing. 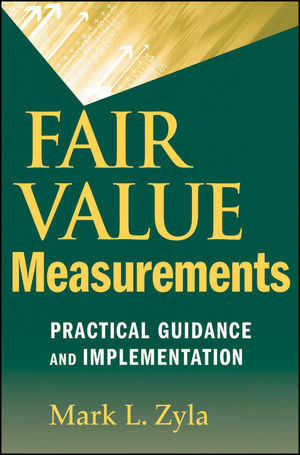 Fair Value Measurements: Practical Guidance and Implementation demystifies this topic, offering you a nuts-and-bolts guide of the most recent developments in preparing financial statements using fair value measurements. This straightforward book covers the best practices on measuring fair value in a business combination and how to subsequently test the value of these assets for impairment. Well-written, conversational in tone, and filled with valuable insights, Fair Value Measurements: Practical Guidance and Implementation lifts the veil of confusion from the substantial and growing requirements for fair value disclosures. Mark L. Zyla, CPA/ABV, CFA, ASA, is currently Managing Director of Acuitas, Inc., an Atlanta, Georgia–based valuation and litigation consultancy firm, providing valuation consulting for various types of entities for the purposes of mergers and acquisitions, financial reporting, tax planning, corporate recapitalizations, as well as valuing various types of intellectual property and other intangible assets. Mark frequently writes and speaks on the issue of fair value in financial reporting. He is coauthor of the AICPA courses "Fair Value Accounting: A Critical New Skill for All CPAs" and "Valuing Goodwill and Other Intangible Assets." He is a coauthor of the International Glossary of Business Valuation Terms, which has been adopted by major valuation organizations. He is a member of the AICPA's Fair Value Resource Panel and is a current member of the AICPA's Impairment Issues Task Force. Mark was also the chairman of the AICPA's first conference on fair value measurements. He was also the vice chairman of the Appraisal Foundation's first Best Practices for Valuation in Financial Reporting Intangible Asset Working Group. He has been on the faculty of the National Judicial College, teaching business valuation to judges. Mark lives in Atlanta, Georgia, with his wife, Jo Ann, and his son, Jack. CHAPTER 1 Fair Value Accounting. APPENDIX 1A Fair Value Accounting and the Current Economic Crisis. CHAPTER 2 Fair Value Measurements in Business Combinations and Subsequent Testing for Impairment. CHAPTER 3 The Nature of Intangible Assets. CHAPTER 4 The Cost Approach. CHAPTER 5 The Market Approach. CHAPTER 6 The Income Approach. CHAPTER 7 Advanced Valuation Methods for Measuring the Fair Value of Intangible Assets. CHAPTER 8 Measuring the Remaining Useful Life of Intangible Assets in Financial Reporting. CHAPTER 9 Fair Value Measurements of Private Equity and Other Alternative Investments. CHAPTER 10 Fair Value Measurements under IFRSs. CHAPTER 11 Disclosures in Fair Value Measurements. CHAPTER 12 Auditing Fair Value Measurements. CHAPTER 13 Fair Value Measurement Case Study. APPENDIX 13A Suggested Case Study Solutions. Information Request for Business Combinations—SFAS 141R. Glossary of International Business Valuation Terms.